German historian and anti-Jewish writer; born at Greifswald March 1, 1781; died at Florence Feb. 1, 1820. As professor of history at the universities of Greifswald, Göttingen (1801-9), and Berlin (1810-1820), and as historiographer of the Prussian state, he wrote a number of works, especially on the history and literature of the northern countries of Europe. 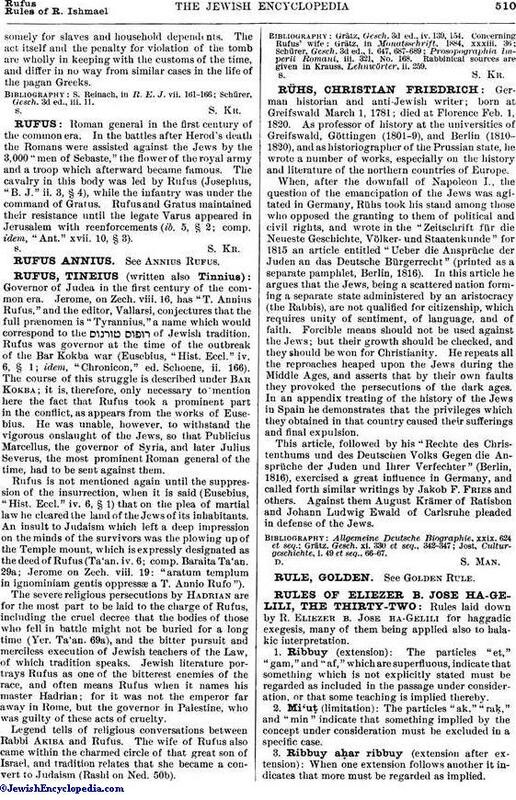 When, after the downfall of Napoleon I., the question of the emancipation of the Jews was agitated in Germany, Rühs took his stand among those who opposed the granting to them of political and civil rights, and wrote in the "Zeitschrift für die Neueste Geschichte, Völker- und Staatenkunde" for 1815 an article entitled "Ueber die Ansprüche der Juden an das Deutsche Bürgerrecht" (printed as a separate pamphlet, Berlin, 1816). In this article he argues that the Jews, being a scattered nation forming a separate state administered by an aristocracy (the Rabbis), are not qualified for citizenship, which requires unity of sentiment, of language, and of faith. Forcible means should not be used against the Jews; but their growth should be checked, and they should be won for Christianity. He repeats all the reproaches heaped upon the Jews during the Middle Ages, and asserts that by their own faults they provoked the persecutions of the dark ages. In an appendix treating of the history of the Jews in Spain he demonstrates that the privileges which they obtained in that country caused their sufferings and final expulsion. This article, followed by his "Rechte des Christenthums und des Deutschen Volks Gegen die Ansprüche der Juden und Ihrer Verfechter" (Berlin, 1816), exercised a great influence in Germany, and called forth similar writings by Jakob F. Fries and others. Against them August Krämer of Ratisbon and Johann Ludwig Ewald of Carlsruhe pleaded in defense of the Jews. Jost, Culturgeschichte, i. 49 et seq., 66-67.